Heavily invested in this exciting Cleveland based company ! Users who like Gil Van Bokkelen, Ph.D., CEO of Athersys (Athersys.com), on their Phase 3 study of MultiStem cell therapy for ischemic stroke with FDA fast-track status, the MultiStem trial for Acute Respiratory Syndrome, and their partnership with Healios in Japan. Users who reposted Gil Van Bokkelen, Ph.D., CEO of Athersys (Athersys.com), on their Phase 3 study of MultiStem cell therapy for ischemic stroke with FDA fast-track status, the MultiStem trial for Acute Respiratory Syndrome, and their partnership with Healios in Japan. Playlists containing Gil Van Bokkelen, Ph.D., CEO of Athersys (Athersys.com), on their Phase 3 study of MultiStem cell therapy for ischemic stroke with FDA fast-track status, the MultiStem trial for Acute Respiratory Syndrome, and their partnership with Healios in Japan. 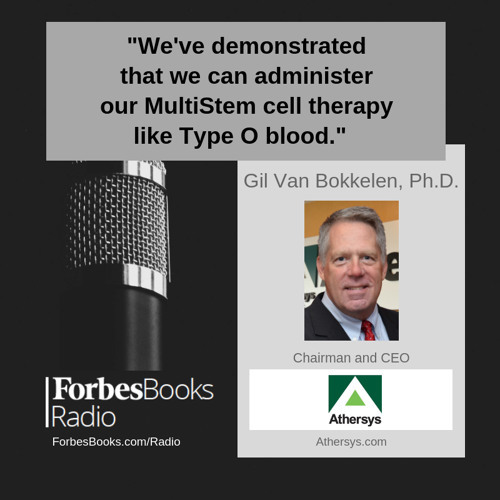 More tracks like Gil Van Bokkelen, Ph.D., CEO of Athersys (Athersys.com), on their Phase 3 study of MultiStem cell therapy for ischemic stroke with FDA fast-track status, the MultiStem trial for Acute Respiratory Syndrome, and their partnership with Healios in Japan.